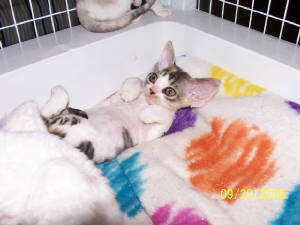 Possible Kittens for show homes. We have a new brown Mctabby white girl of our own Breeding and also one littter due in December with our own lines, if interested in a Kitten or an adult to show please e-mail me at sparvin@wctc.net There are also 2 girls that we are retiring (look at the Retired section) One is excellent for showing and Breeding and the other would just be a Breeder. 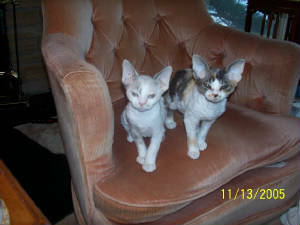 One is a B girl and one has a nice head but her coat is not as good as we would like. She would have to be bred to a strong coat. Her mom has a great coat, but her father had a slow coat. These girls could be shown, I believe very sucessfully, they are dolls and really love everyone.